2018 August 28: Summer is not over yet! These ones are a must for the season! Books of the Week Summer is not over yet! These ones are a must for the season! After Ira Rott’s elephant rug pattern went viral in June 2016, there was a huge spike of interest in the pattern and its designer. Now with thousands of followers on YouTube and Pinterest, fiber artist Ira Rott is sharing over 20 designs for Animal Rugs and Accessories in CROCHET ANIMAL RUGS (F+W Media / SewandSo; August 2018; Trade Paperback; $22.99). Each rug design is accompanied by a matching pillow design and a smaller accessory to continue the theme. Get creative and transform your child’s room—with decor your kids will adore—into a magical modern bedroom inspired by animals with accessories ranging from security blankets to stool covers, bed book tidies, placemats and toy bags. Crochet rugs are the perfect place for your children to read and play. 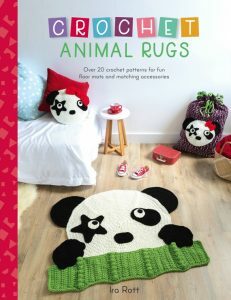 The book features 21 animal-themed patterns. Choose from an amazing elephant, a sweet giraffe, a cute cat, a fun-loving monkey, a cool crab, a friendly dinosaur and a rock-star panda! You can decorate a child’s room or nursery with items from this book and spend only a few evenings making each piece. This book has the cutest rugs! I think I have to learn how to crochet just so I can make some of them!! This one is a must-buy! Creepy Carrots and Nerdy Birdy author knocks it out of the park (and off the surfboard) with a creative and hilarious picture book featuring the most expressive story ever created out of one single word. Fresh off his Caldecott win for Beekle and After the Fall, Dan Santat does not hold back in this wild tale of unexpected friendship. 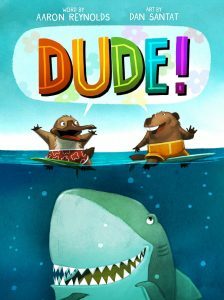 This book will draw much attention; what could be more fun than a platypus, beaver, and a shark surfing together? And kids will have a fun time figuring out all the different ways to say “dude”. This one is such a cute story with very little words and I recommend highly for young readers! Building off the success of Gertie’s Leap to Greatness, Kate Beasley’s second novel will bring new readers to her books while delivering a highly satisfying story for established fans. 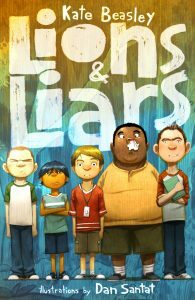 LIONS & LIARS is great for fans Carl Hiaasen, Kate DiCamillo, Louis Sachar, Katherine Applegate, and Barbara O’Connor. Beasley creates a fun, unique, and wholly contemporary take on the intricacies of male relationships. She makes difficult issues like bullying, masculinity, and loneliness easier to talk about with her fantastic humor. With her signature style, Kate has spun a tightly-crafted, hilarious, and heartwarming tale. Her characters’ vivid voices are unforgettable–and the plot moves along at a fast clip. LIONS & LIARS is an exciting read! Vera’s graphic novel debut, Anya’s Ghost, has received an Eisner, Harvey, and Cybils award. Her picture book Leave Me Alone received the Caldecott Honor in 2017. Vera is a master at making us relive painfully awkward camp experiences with laughter and empathy. In her new book, all Vera wants to do is fit in—but that’s not easy for a Russian girl in the suburbs. Vera’s single mother can’t afford that luxury, but there’s one summer camp in her price range—Russian summer camp! Vera is sure she’s found the one place she can fit in, but camp is far from what she imagined. And nothing could prepare her for all the friendship, drama, endless Russian history lessons, and outhouses straight out of nightmares! BE PREPARED is also about the immigrant experience—this book is an autobiographical story that deals with Vera’s experience immigrating to the United States from Russia as a child. Vera Brosgol was born in Moscow in 1984 and moved to the US when she was five. BE PREPARED is perfect for middle-grade readers, fans of Real Friends and Anya’s Ghost, and anyone who has ever felt out of place in the world. Contemporary realistic middle-grade graphic novels are on the rise! With books from authors like Victoria Jamieson, Cece Bell, Shannon Hale, and Svetlana Chmakova, kids are craving these kinds of stories in this format. Hope is the acclaimed author-illustrator of A Wrinkle In Time: The Graphic Novel, which was on the New York Times bestseller list for forty-four weeks. This is the first book she has both written and illustrated since the smash success of that graphic novel. 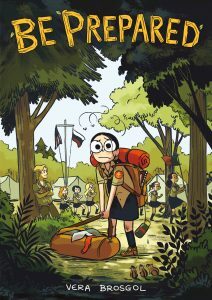 In the vein of Raina Telgemeier, Hope writes accessible, kid-friendly stories that are relatable for fans of comics and beyond. 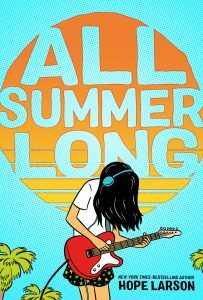 Bina is a lovable female protagonist—from her love of underground music and desire to start a band, to her relationship with Austin and how she learns to take his changes in stride, Bina handles the struggles of adolescence with humor and grace. Contemporary realistic middle-grade graphic novels are on the rise! With books from authors like Victoria Jamieson, Cece Bell, and Svetlana Chmakova, kids (and adults) are getting on board for stories in this format. Self Disclosure: I received free copies of the above books to facilitate this post. Cover images and information also provided. I do not feature all the books that I receive but feature those that I highly recommend. 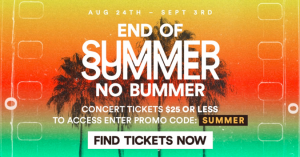 Summer may be coming to an end, but House of Blues Anaheim has announced a special ticket deal that will bring the summer heat this fall. From August 24 at 10am PST to September 3 at 10pm PST you can purchase tickets for $25 or less using promo code SUMMER. To purchase tickets click here, while quantities last. To purchase tickets click here, available while quantities last. 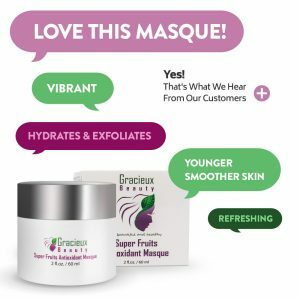 I love the Gracieux Beauty Super Fruits Antioxidant Masque! This one is a Beauty-Must-Buy! 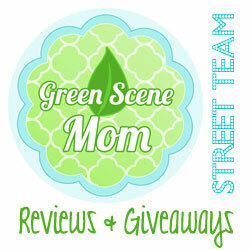 Looking for a great Facial Masque that has natural & organic ingredients and leaves your skin feeling clean and softer? 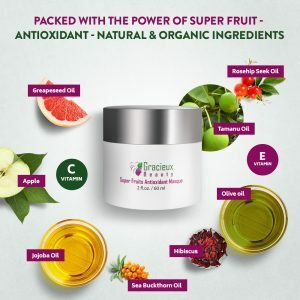 I just love the Gracieux Beauty Super Fruits Antioxidant Masque! My skin actually feels smoother! They combine Blueberry, Cranberry, Oregon Grape, Bayberry, Cayenne and Seabuckthorn. I am truly impressed with the natural ingredients in this Masque. It’s super easy to use and I recommend using at least once a week! It really does leave my skin feeling refreshed! 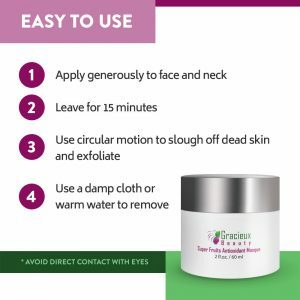 I honestly think it is one of the best skin products I have tried! 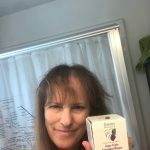 This company also has a variety of other products so check out their website! There is a coupon code that is good through September 30th, 2018 and gives you $10.00 off. It is ma10off. Self Disclosure: I received a free sample to facilitate this post. 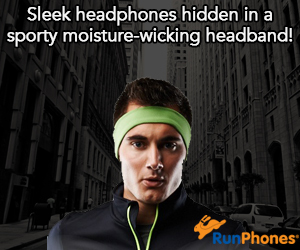 Images were also provided for my use.